While many people enjoy the early-season color of annual flowers, perennials are like old friends returning to visit year after year. There’s no need to re-plant each spring because they keep growing until they reach full maturity. They may die to the ground during the winter, but they’ll return again each spring. For the most part, perennials require minimal care. Most do need deadheading, cutting back, and watering. While the individual blooming seasons for each perennial are much shorter than annuals, some do bloom almost all summer. However compared to annuals, they are very low-maintenance. Although some perennials such as native Minnesota grasses and wildflowers can survive on rainfall, watering is necessary for most others. You can choose either hand watering or a landscape irrigation system. How frequently should you water? One deep watering per week is better than numerous shallow waterings. The best practice is to water early in the day using a soaking technique at ground level. Since watering the foliage can cause diseases to be spread, a drip irrigation system or soaker hose works well. Perennials planted in June or later in the summer require more initial care. The garden area should be prepared with humus or some organic matter, allowing for enhanced moisture retention. Newly-established garden beds of perennials or annuals should be mulched with four inches of mulch to ensure good drainage and optimal root growth. Mulching will retard weed growth and improve the overall appearance of a garden. Keep the mulch away from the crown of the plant to keep it from rotting. Scheduled maintenance should include shearing the tops off of spring-blooming plants in June to give them a uniform and ornamental look for the reminder of the season. 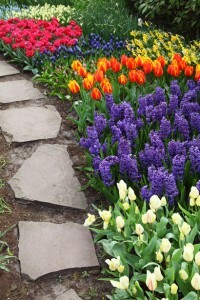 Daffodil and tulip foliage should be cut back about six weeks after they bloom. Early to mid-June is a good time to cut back late-season bloomers by half. This will help to control height and will eliminate some of the need for staking. Perennials that are pruned like this will mature at a shorter height and may flower later compared to those that haven’t been pruned. Many perennials thrive on being divided periodically. As a general rule, divide perennials that bloom later in the season in the spring, and plants that flower in the early spring in the fall. Consult a good plant reference for variety-specific directions. If you’d like to add perennials to your landscape but don’t know where to start, please give us a call. We’ll work with you to add low-maintenance color to your yard.